Rotary refractory gunning machine is designed for spray refractory machinery and design. Rotary fire-resistant spray gun and ordinary dry spray concrete shotcrete machine compared with some prominent features, low bounce, low dust. As we all know, refractory materials are more expensive than regular concrete. Low rebound waste less, customers reduce the cost of spraying refractory construction cost is very important. High German equipment refractory jet costs, including fire-jet machine host, high-pressure water pumps, delivery hoses, water hoses and new pre-wetting nozzles. Need to add water nozzle, so that water evenly, to the nozzle water ring atomization effect. If so, rotating refractory shotcrete machines need to be equipped with high-pressure water pumps, rather than ordinary water pumps. In addition, our nozzle is equipped with a needle valve instead of a ball valve in order to precisely regulate the amount of water. Needles can accurately adjust the amount of water, do not need skilled operators can control the amount of water. 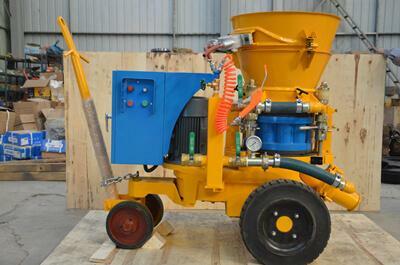 About machine colors, usually we have two colors blue and yellow for customers to choose. We can customize the colors of our machines according to the needs of our customers.